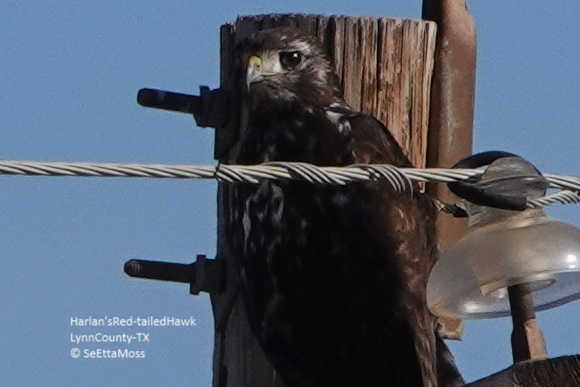 I spotted this dark morph Harlan's Hawk perched on a pole just outside of the small town of Manzanola, CO two days ago. I inadvertently flushed it and it's bright white leucistic feathers made this bird really stand out. I see several Harlan's Red-tailed Hawks most years but I have never seen a leucistic one. 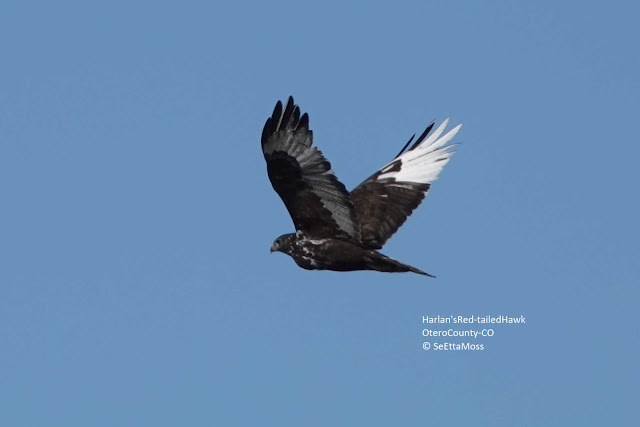 Dark morph harlani characteristics include blackish body and underwing coverts, substantial white on it's breast, white streaks on head, white underside of tail with blackish terminal band contrasts with the blackish uppertail that has some white basal feathers. The bright white leucistic wing feathers are most eye-catching. As I was driving north on the way back to Colorado I spotted this Harlan's Hawk perched right next to H87 a little north of O'Donnell, TX over the week-end. As I was driving the 75 mph speed limit I had to make a turn several hundred yards down the highway and go back to confirm it. Like most other Harlan's Hawks I have observed it was extremely sensitive to being looked at and photographed so even though I stopped on the shoulder of the other side of this divided 4 lane highway it took off before I could take any photos. It did just fly to the next utility pole so I carefully followed and stopped even further back to get the photos which I took from inside my car so even though I took the pics at 600mm I still had to crop them severely to get these pics.